Aboriginal women and girls are at higher risk of becoming victims of human trafficking in Canada than non-aboriginals, according to Canada's National Action Plan to Combat Human Trafficking. This selling and abusing of people -- a modern-day form of slavery -- is one of the pieces that make up the complex puzzle of Canada's more than 1,100 missing and murdered aboriginal women. And another reason we must take action. The distraught woman paced the streets, clearly in search of someone. She broke down in tears when police approached. "I'm looking for my daughter. She's being pimped out by a boy who's in a gang, and I need to find her." In no time, a sting was set up. The trafficker was arrested and the girl restored to her family on a First Nations Reserve in northern Alberta. She was one of the lucky ones. Many more victims end up on Canada's too-long list of missing and murdered women. The story of the girl and her mother -- their names have been omitted for privacy -- was one of many heard by Canadian researchers, Yvonne Boyer and Peggy Kampouris, when they conducted a study for Public Safety Canada on the trafficking of aboriginal women and girls. We spoke with Kampouris about why First Nation women are at greater risk, and the challenges of addressing this appalling trend. Kampouris told us underlying issues, like higher rates of extreme poverty, substance addiction, family violence and sexual abuse, make aboriginal women more vulnerable to exploitation. While these factors are often found among other groups of trafficked women, Kampouris said what makes them unique for aboriginal women is that the family issues have often been present through many generations. Old policies, like the residential schools, traumatically disrupted family and community bonds and cultural identity, leading to generations of dysfunctional families and issues like drug addiction. Perhaps the most horrifying legacy of this history is that, because of problems like addiction and abuse, it is not uncommon for aboriginal girls to be trafficked by their own families. Many other aboriginal women and girls are lured by a "boyfriend," showering her in gifts -- often getting her addicted to drugs. When the relationship is established, emotional and physical extortion are used to traffic the victim to other men. 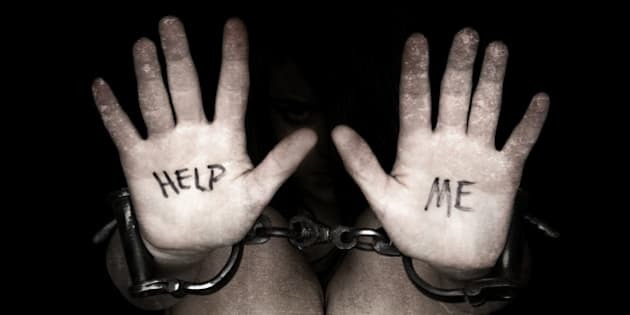 These heart-breaking situations, are made far more difficult by Canada's definition of human trafficking. According to Kampouris, for a case to be considered trafficking under the Criminal Code, there must be a real or perceived threat to the safety of the victim, or their family. When there's a relationship to their trafficker, the victims sadly may not feel this threat and won't go to police. Cases become harder to prosecute. Kampouris recalled one deplorable incident in the Northwest Territories. A man stood accused of multiple charges on the trafficking of a 14-year-old Inuit girl. The judge threw out the specific charge of human trafficking, arguing there was a question whether the girl had consented to being prostituted. When victims do manage to escape trafficking, Kampouris tells us there is little support for them. Most Canadian agencies and organizations aren't adequately funded or equipped to meet their complex needs, which include safe, long-term shelter, and help dealing with trauma and addiction. "It's not just a matter of providing a place to sleep. They need to heal," Kampouris said. This month, representatives from national aboriginal organizations and federal and provincial governments will meet in Ottawa for a much-needed national roundtable on missing and murdered First Nations women. They will discuss the causes, like human trafficking, and the steps we can take to prevent them and support the survivors. The trafficking of aboriginal women and girls is not a problem without solutions. And those solutions include better training and more resources for police human trafficking units, amending the legal definition of human trafficking to aid in prosecution and offering more support for victims. And, of course, we can address the chronic poverty and lack of family support in aboriginal communities. That Canadian aboriginal women and girls are sold like merchandise on our city streets should be considered nothing less than a national disgrace. This is the third in a four-part series on aboriginal issues and people in Canada.